WE HAVE 2 TOWNHOUSES FOR RENT SIDE BY SIDE! WINTER SALE! From JANUARY 1st thru MARCH 30TH, 2019. Stay 7 nights and 8th Night is free!! !This upscale gated complex townhouse with central A/C has a relaxed private ambiance and is a much better tranquil get-a-way from a crowded hotel with taxes. We are located less than a mile from Baha Mar Resort Hotels--the Grand Hyatt and SLS Hotel--and Jack Nicklaus Signature Golf Course with par 72 and hole course. The Garden: We are conveniently located less than a mile from Melia Nassau Beach Resort and Breezes Hotel. Just step outside the Townhouse and explore within our secure gated grounds various seasonal trees bearing organically grown fruit. Bask in nature and enjoy organic sun ripened gifts: bananas, pigeon plums, papaya, avocado, sugar apples, noni, aloe vera, passion fruit, coconuts, red and black mulberries…all complimentary. Sample whatever is in season. Yes, we aim to please! Fish, Ponds and Birds: The children will absolutely love feeding (with supervision) the on site birds and fish. There is also a park at the nearby Goodman's Bay Beach/Cable Beach where they can play in the swings and enjoy a wholesome cultural interaction with Bahamian children their age. Flowers: We have a splendid array of flowers, plants and orchids. Take a stroll around the property and you will see tropical birds, , a vast variety of native flowers, plants and fruit trees and a small organic seasonal vegetable garden. Sample whatever is in season. Then step into a modern charming and exquisite Bahamian neighborhood. All of the homes have their individual design and charm. We are located just 1 minute away from the former Prime Minister’s residence. Julie, the Property Manager, lives onsite and is very attentive to her Guest. She has been renting this space for the last 10 years and has had scores of satisfied Guest who often leave as her friends. Julie--our host could not have been nicer. She brought us to the grocery stores hours after our arrival--gave us visitor passes to a Club at Cabbage Beach on Paradise Island--and treated us like her own family. Our rental was quite nice--with plenty of space for the four of us and --and amenities that you only find at your own place at home. 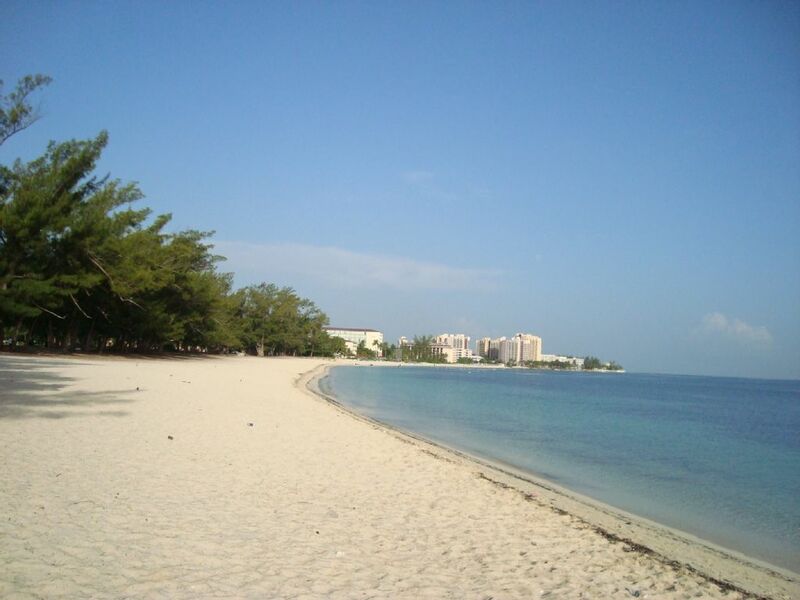 A quick 10 minute walk to Saunders Beach--and easy access to all areas of Providence. I highly recommend! We were in Nassau, Bahamas for a wedding at the BaHa Mar Resort. Due to the size of our family, we decided to rent a condo from VRBO. We couldn’t be more pleased with our condo. It was in walking distance to BaHa Mar. Right down the street you can hop on the city bus for $1.25. It was in an excellent location. Julie was so accommodating. She had our kids picked up from the airport, gave us a tour of the city, dropped us off on the wedding day and dropped off at the airport. If your traveling to the area I highly recommend this condo! My wife & I have visited the Nassau area five times over the last 3 years and have now added this location to places we have enjoyed staying at. Julie and her family make wonderful hosts and have provided a clean, comfortable, secure residence for vacationers like us. The location is close enough to the beaches and local transportation while providing a local neighborhood ambience. Having "prompt" transportation arranged and covered, from and to the airport, is an appreciated feature of staying here. Julie also arranged trips to the grocery store , a must when eating most meals in and not having a car rental as part of our vacation. I have no hesitation to recommend this townhouse as a Great Spot, Great Value & Great Hosts . We traveled to the Bahamas to attend a wedding and stayed in Julie's lovely Townhouse from October 23-30, 2010. Her townhouse was very clean, comfortable, well equipped, secure and convenient to the wedding, and all of our other adventures. The professionalism of our contract combined with the warm hospitality upon arrival was much appreciated. We especially liked being picked up at the Airport by Cheryl and our trip to the grocery store. While we thought we would do some cooking on our vacation we ended up only fixing breakfast and enjoying it on the back patio, communing with the birds and the two resident cats. We were able to catch the bus or walk to numerous locations and then we took cabs back in the evening. During a few relaxing moments we watched the video provided of the 2009 Junkanoo and wish that we could return for the Boxing Day Extravaganza. The Bahamanian people were all very friendly and made our vacation a very pleasant and memorable one. My family and I spent a blissful 2 weeks in The Townhouse. The location for exploring is excellent and it is really easy to find your way around the whole island from such a good base. We enjoyed walking to the beautiful Cable Beach which is literally at the end of the road. The beach is so peaceful and very safe for kids that refuse to leave the water, as ours did!! The Townhouse itself is very clean, comfortable and well equipped with everything you may need. If you do happen to need anything then Julie is so friendly and accommodating. It honestly felt more like staying with friends for us, than a holiday let. We cannot wait to return and feel we have been spoilt for future European trips that will never live up to this awesome Island!! The 3 main reasons to visit are, wonderful weather, beautiful beaches and most importantly the friendly and welcoming Bahamian People. Big Thanks to Julie and Cheryl for making our time in The Bahamas so special. The former Prime Minister’s Residence is 1 minute walk away. Relax in Nassau’s exclusive West Bay Street Grove. Townhouse is 5 minutes walk to 3 breathtaking white sandy beaches, public transport and the Cable Beach Strip. The world-renowned Cable Beach Strip is known for its Las Vegas style casino, enchanting nightlife, luxury hotels, great international restaurants, sunbathing & water sports. Take a 5-minute walk and spend the day at Cable Beach 9-hole Golf Course, there you will find 7,040 yards of well-maintained greens and fairway inclusive of 13 lakes and 50 sand traps. A 3 minute walk to the bus stop transports you to the nearby places of interest: Fort Charlotte (tour an ancient dungeon, this fort was built in 1789 by Lord Dunmore), Ardastra Gardens & Zoo (home to the world famous Marching Pink Flamingos), Arawak Cay (Native Restaurants and Night Life), the Straw Market, Downtown Nassau, Atlantis/Paradise Island and superb restaurants. There are 2 major supermarkets nearby. Reduced WINTER Rate: From January 1st- March 31st, 2019 get the 2 bdrm/2.5 bath or the 1 bdrm/1.5 bathroom at a lower rate. USD$400 required to reserve unit. Upon arrival the USD$400 deposit translates into a refundable damage/security deposit 25% of rental rate due at the time of booking Remaining 75% of rental rate due 30 days prior to travel WE HAVE TWO TOWNHOUSES SIDE BY SIDE FOR LARGE GROUPS Rates include transfers to and from airport, 30 minute trip to the food store included.